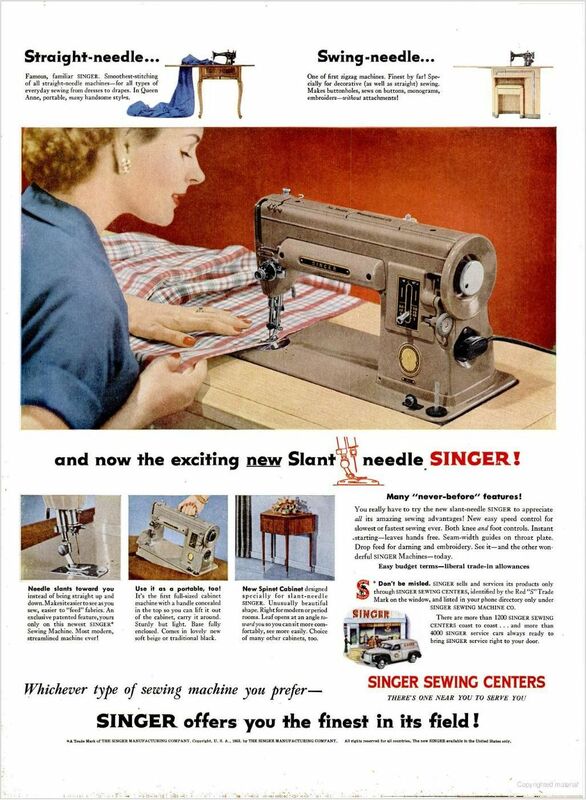 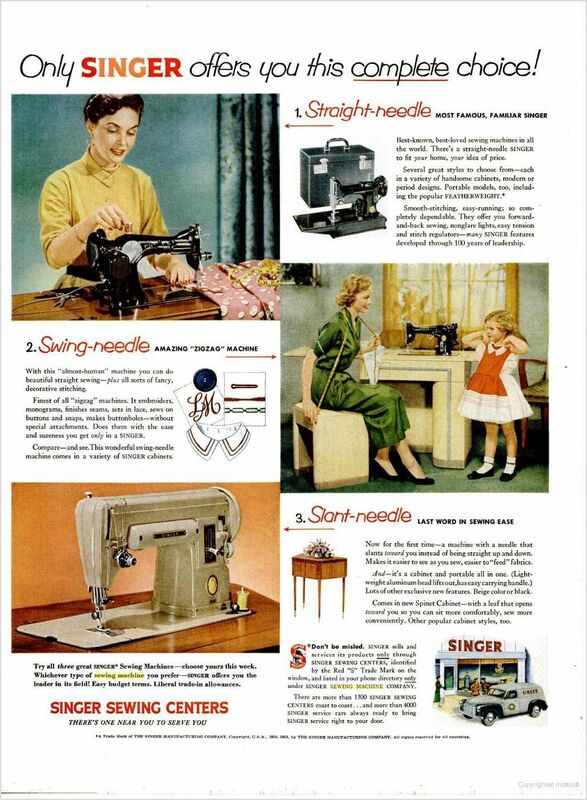 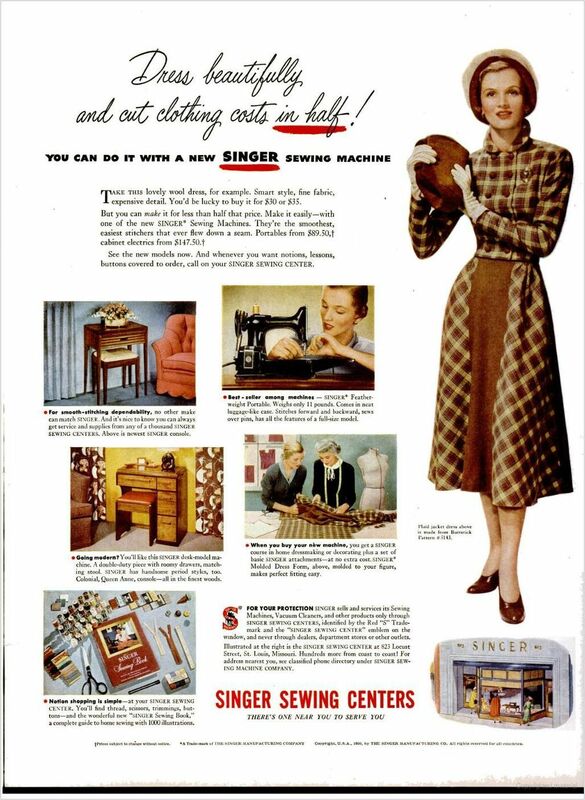 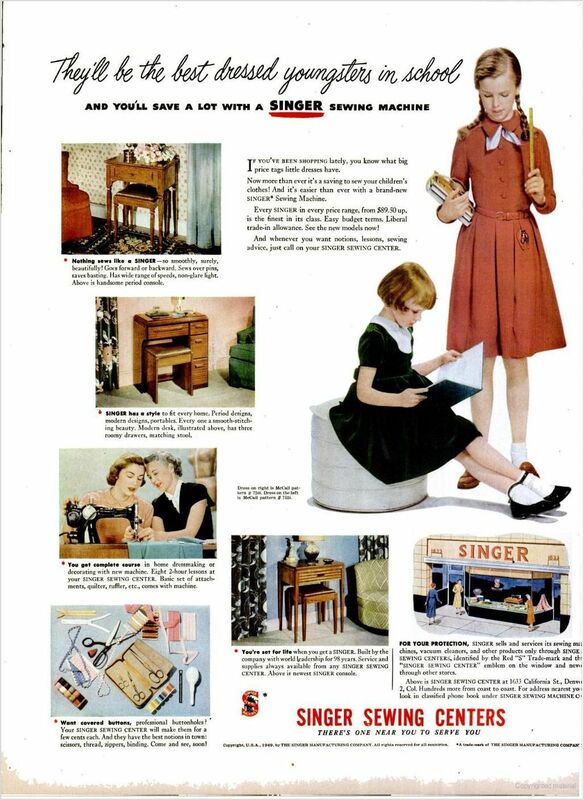 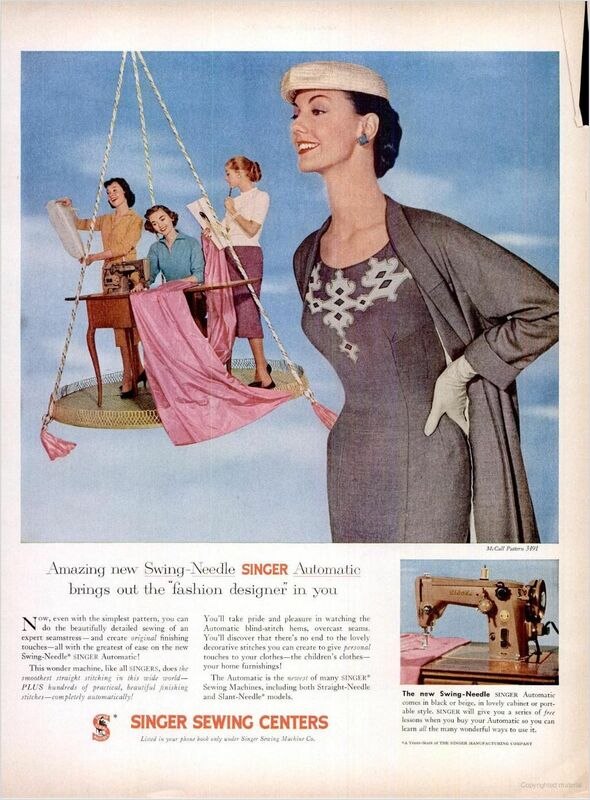 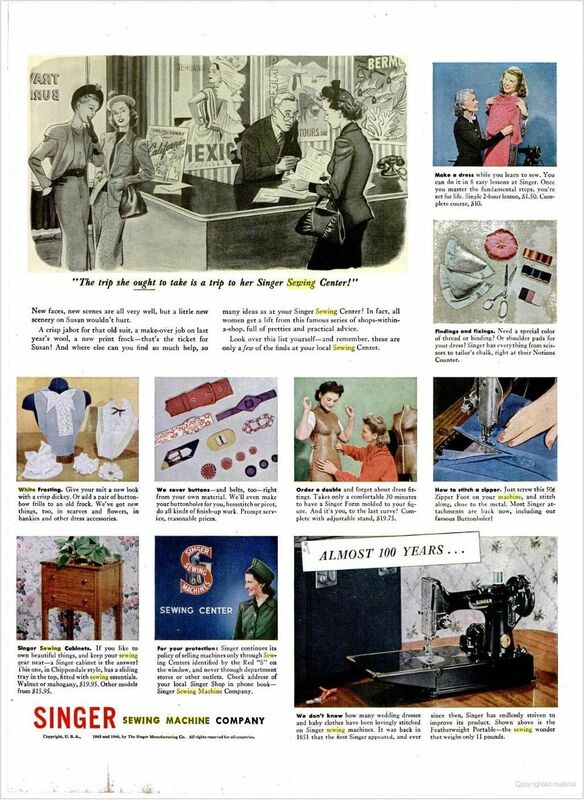 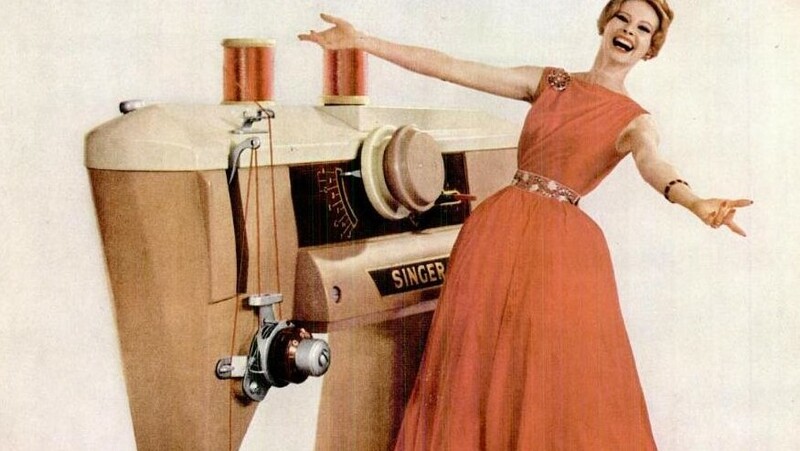 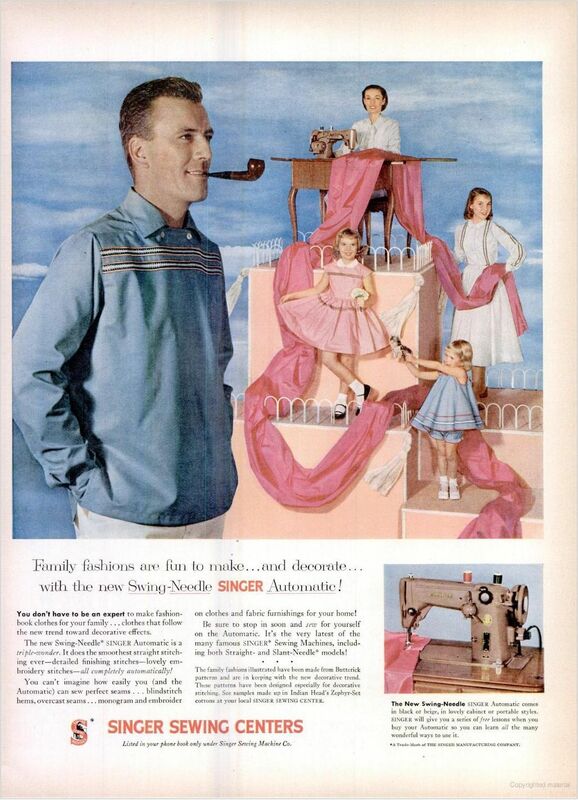 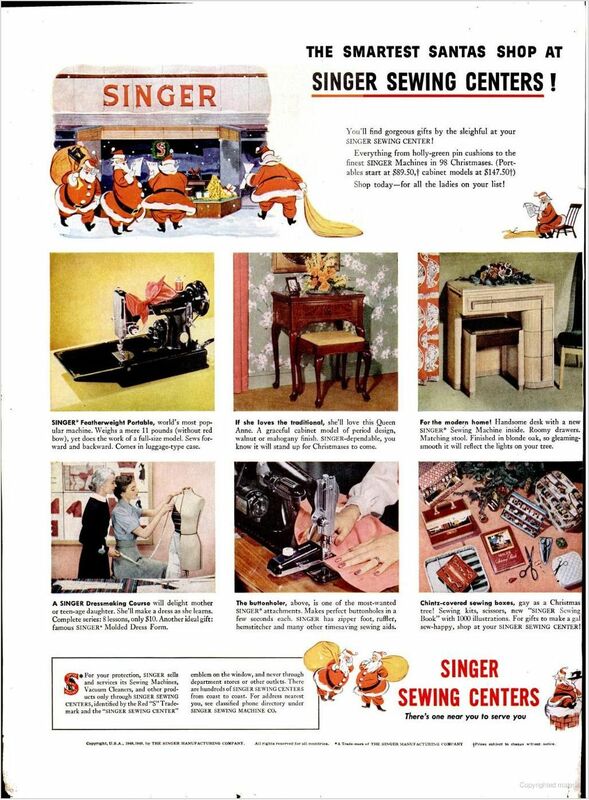 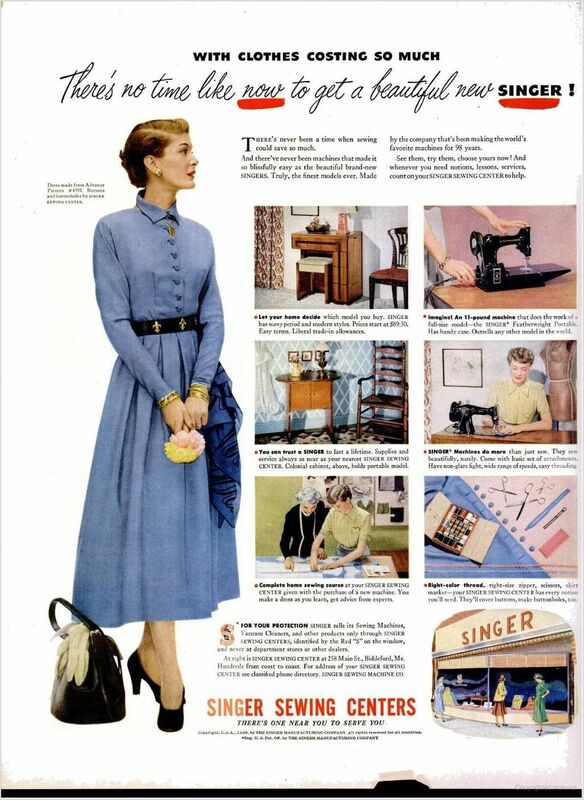 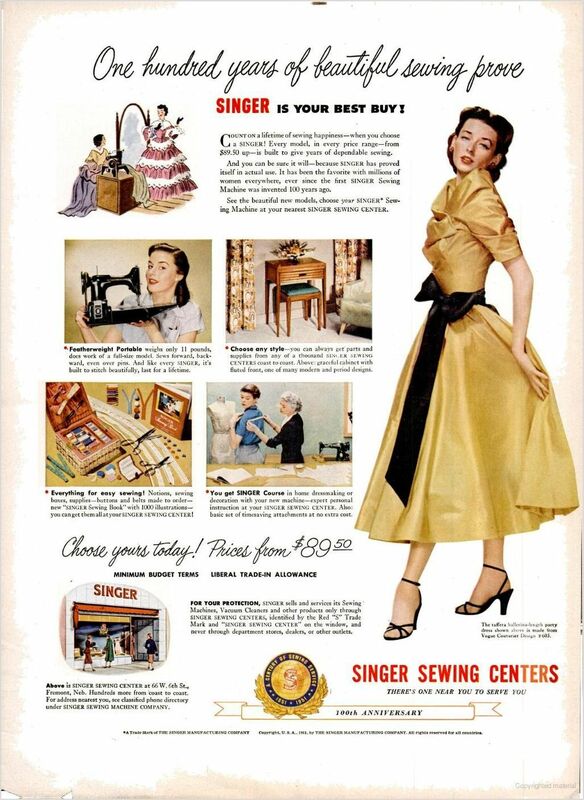 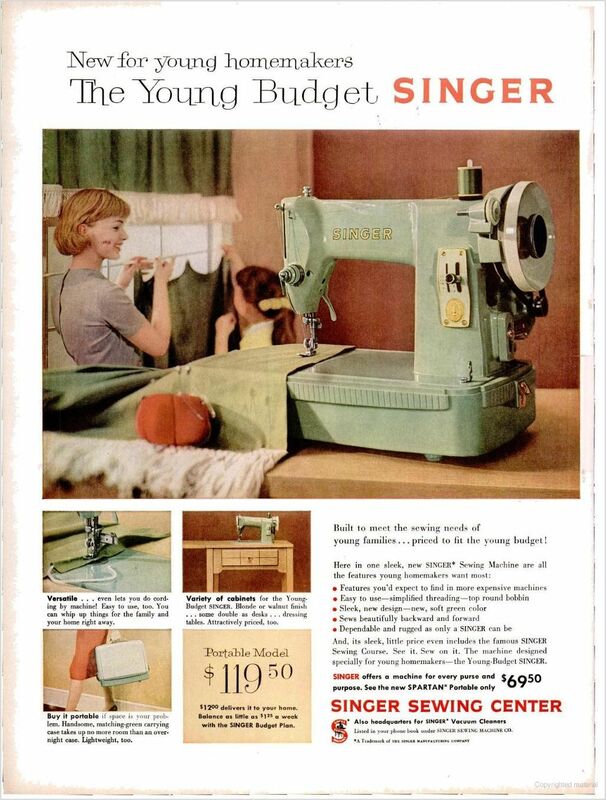 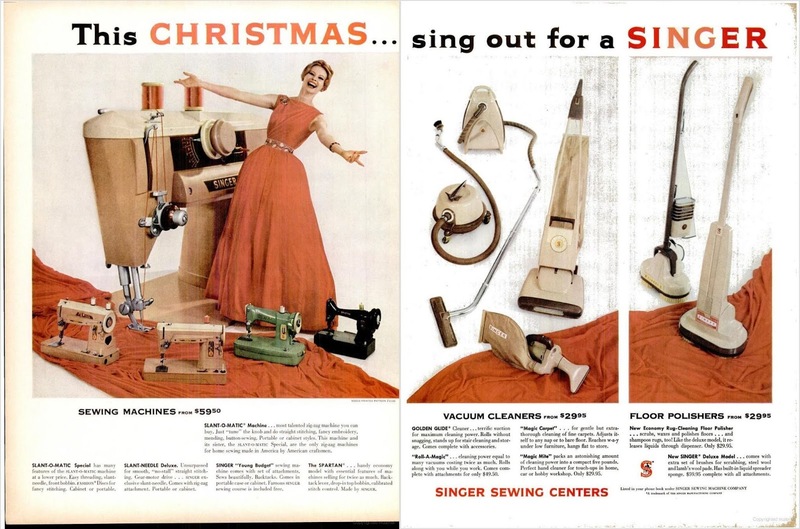 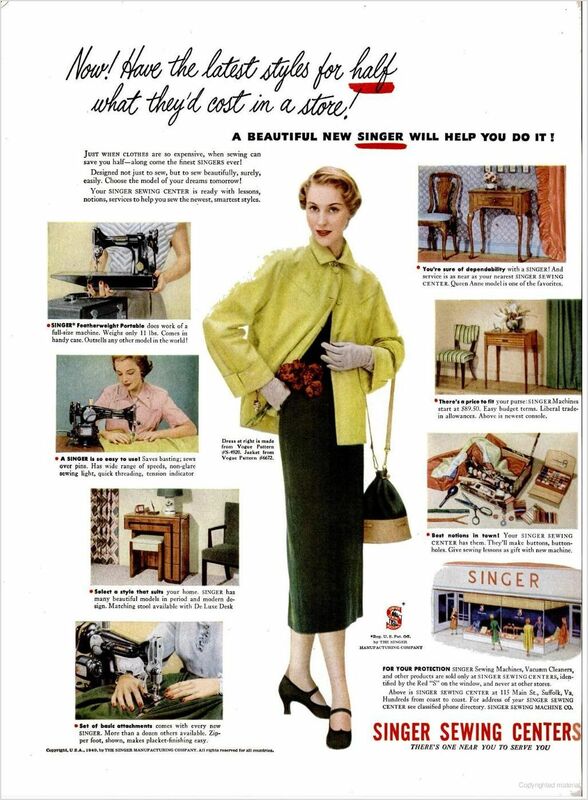 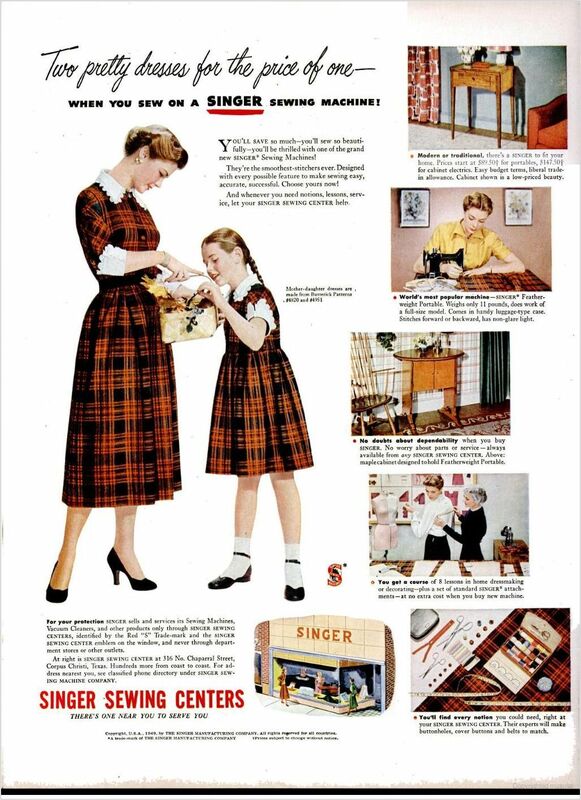 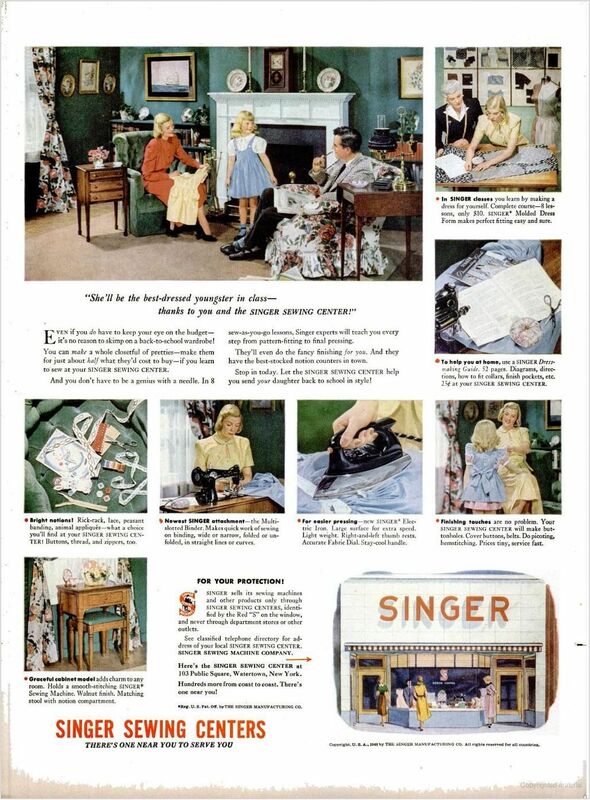 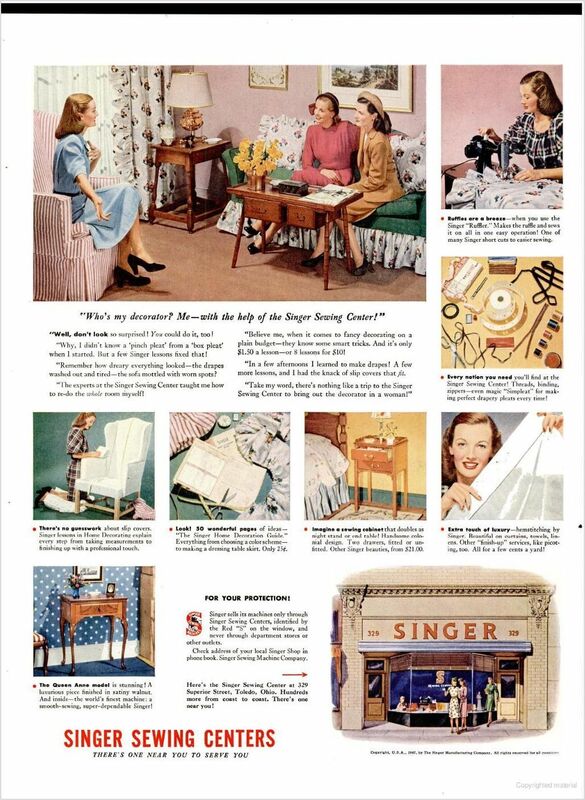 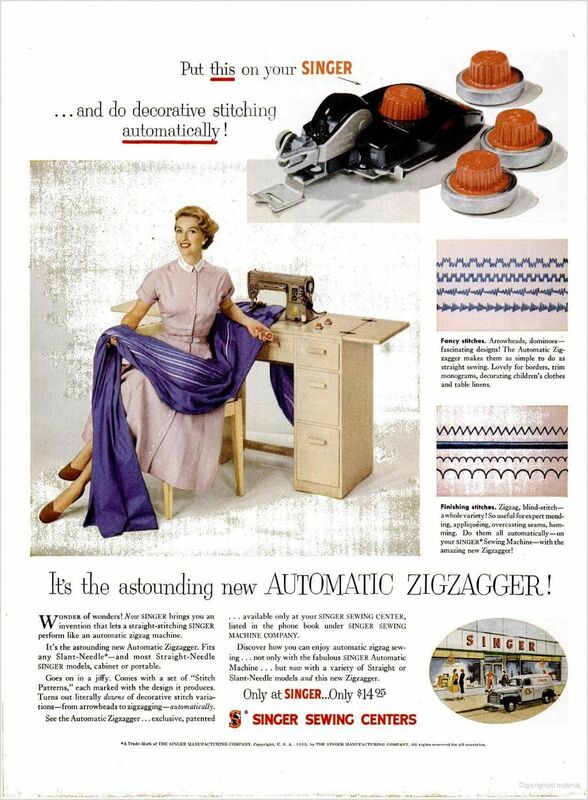 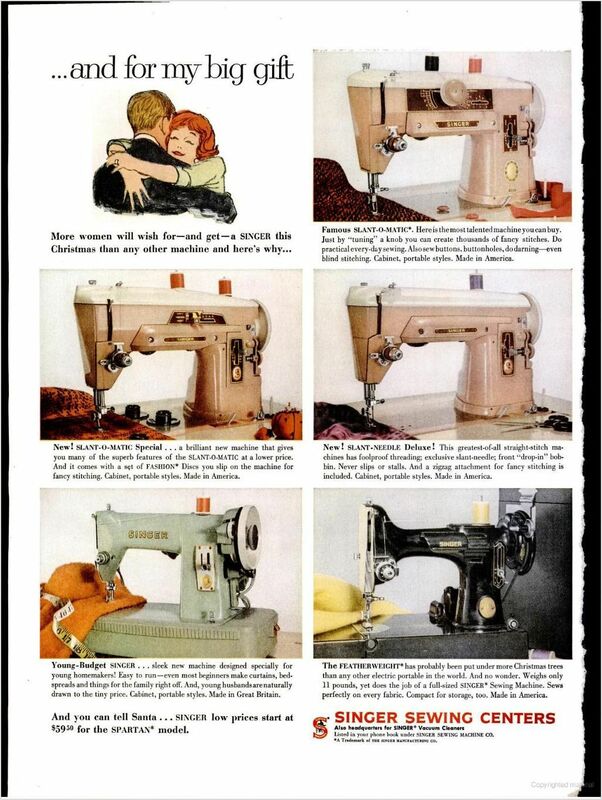 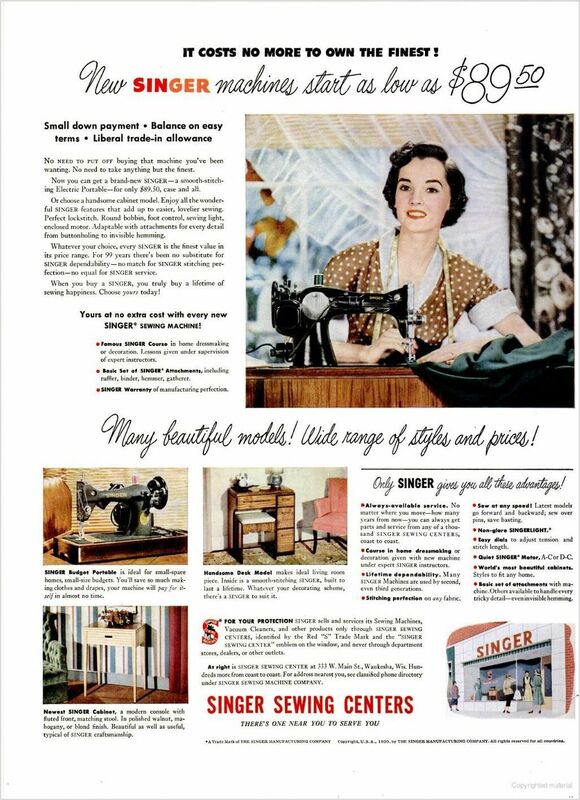 As the social standards and customs of the 1960s receded and the 1970s evolved, women's roles were changing rapidly in America; but from the 1940s through the mid-1960s, Singer's ads reflected a consistent image of the American housewife. 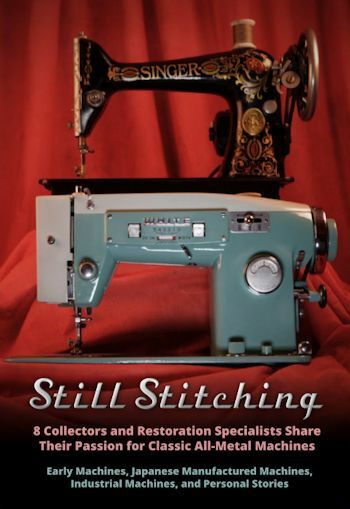 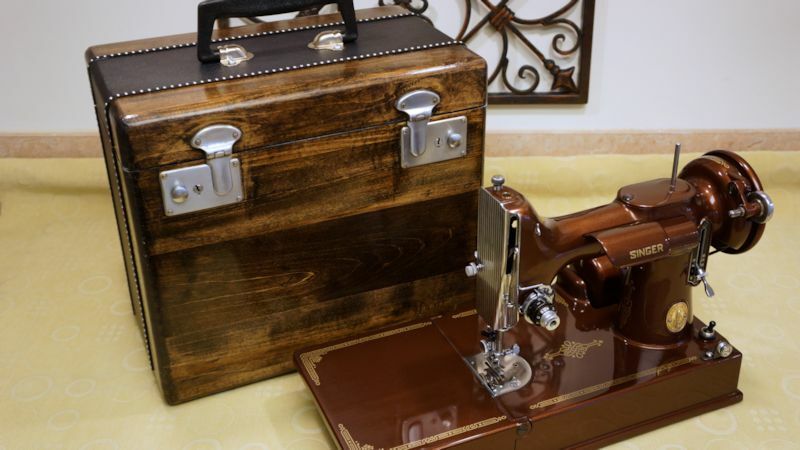 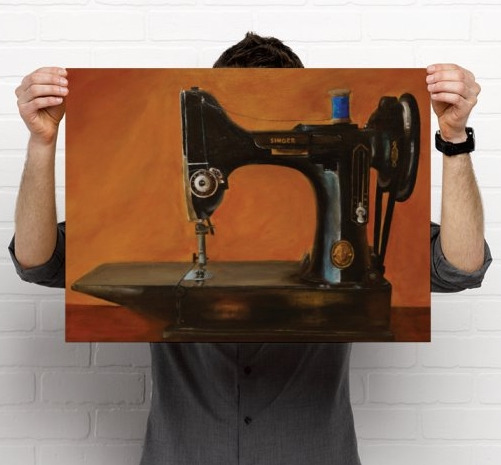 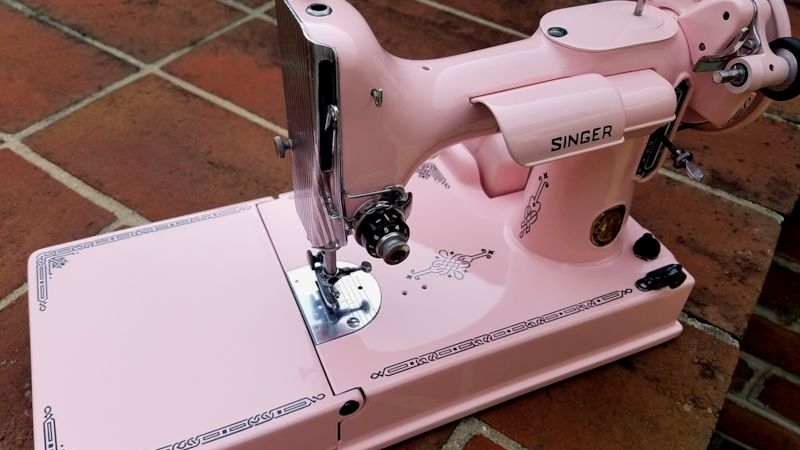 Elegant, beautiful, and very capable with her sewing machine. 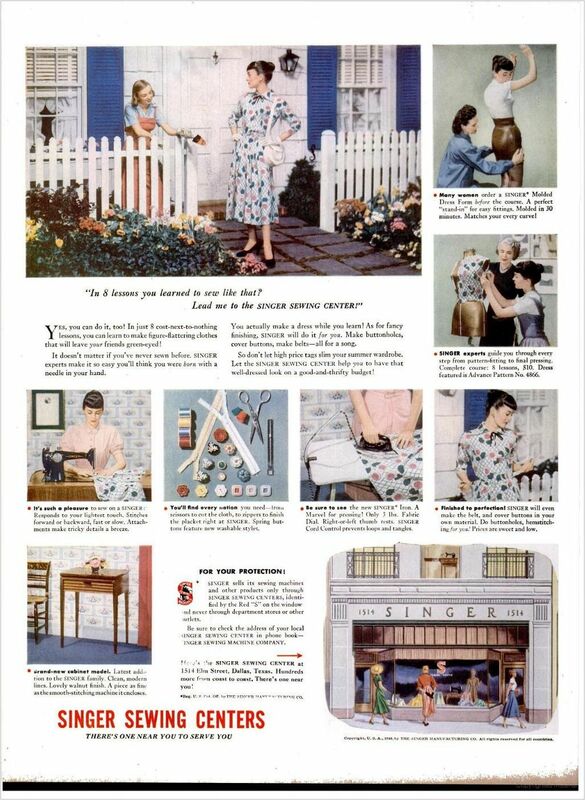 The turbulent American economy of the seventies, the ongoing effort for women's equality, and cheap overseas manufacturing led to a decline in traditional domestic skills and effort that had long been considered the responsibility of women. 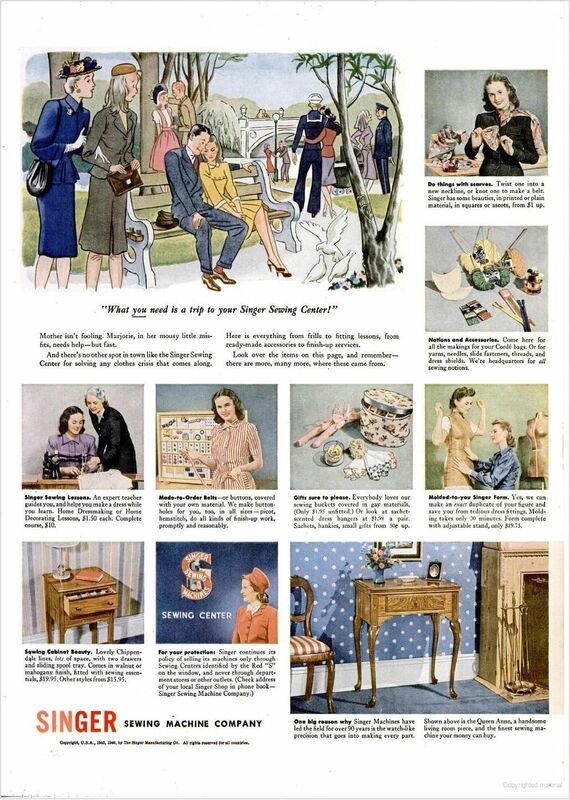 The pursuit of the "American Dream" by Baby Boomers in a modern post-war era meant a tremendous shift in values and lifestyle. 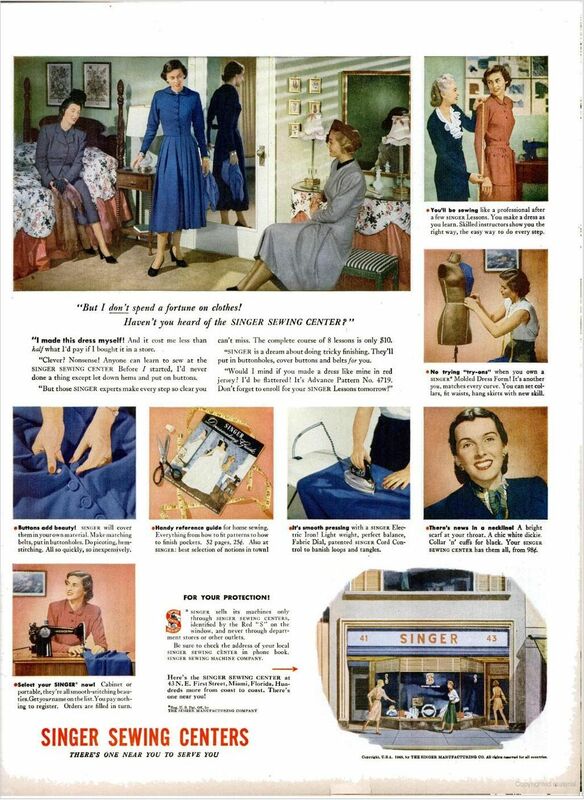 Women increasingly contributed to dual-income households, and fewer families made or repaired their own clothing and fabric goods. 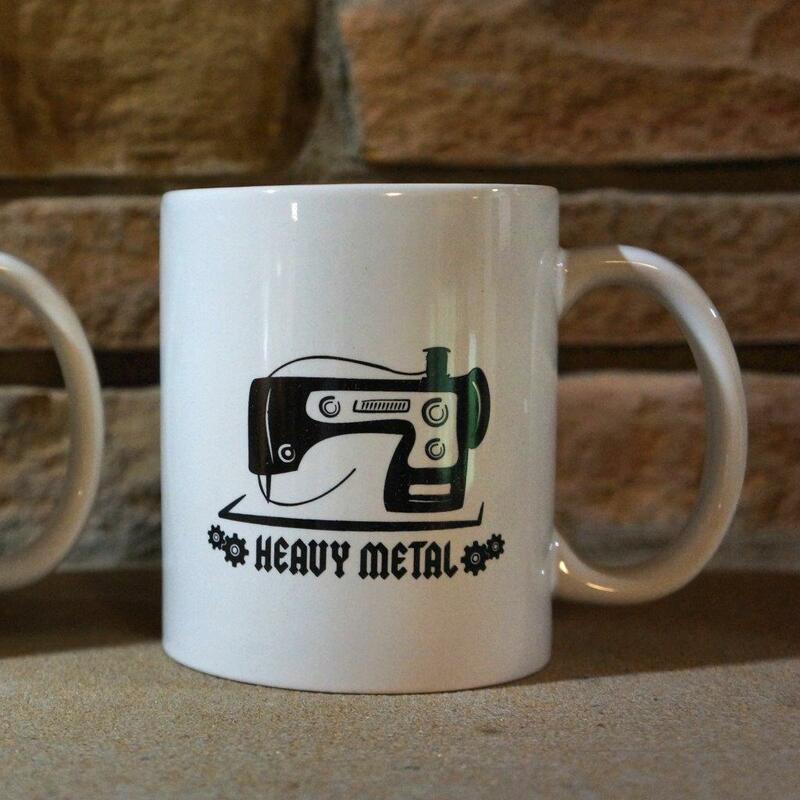 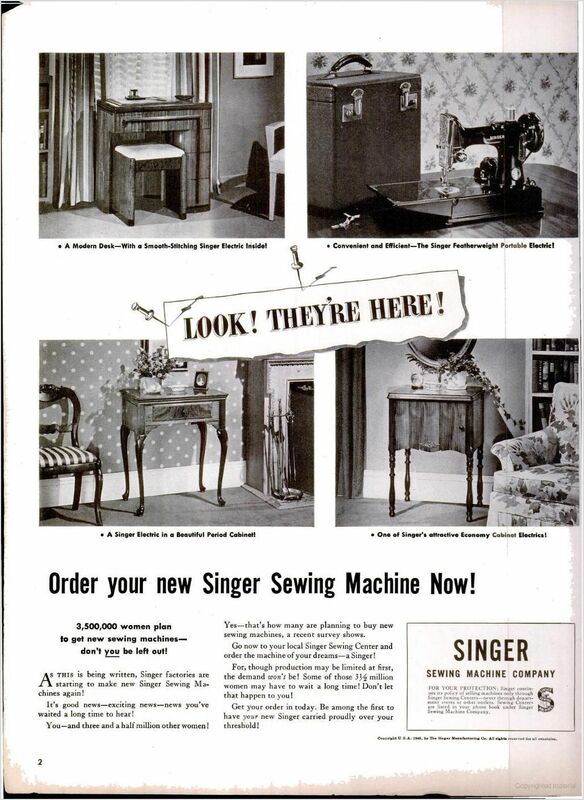 Meanwhile, plastic and nylon as well as lighter metal parts rapidly replaced the heavy all-metal components of domestic sewing machines. 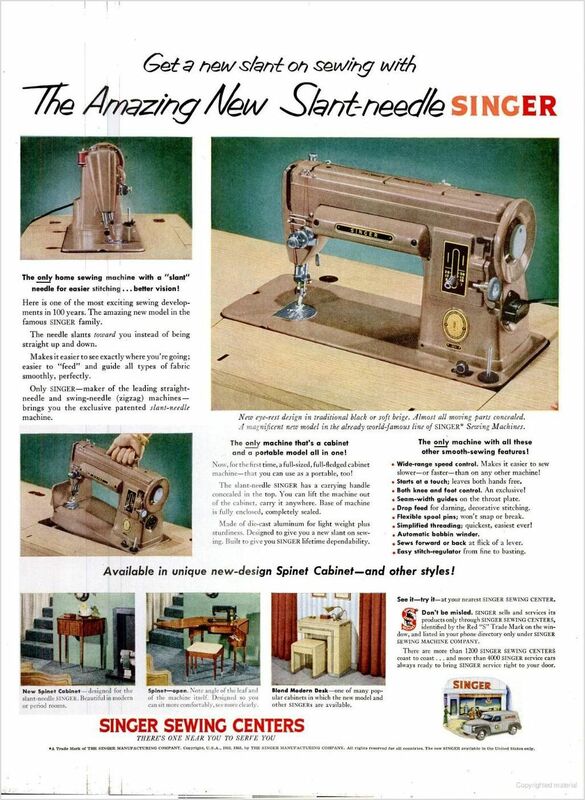 What was once an heirloom-quality product became a throw-away appliance. 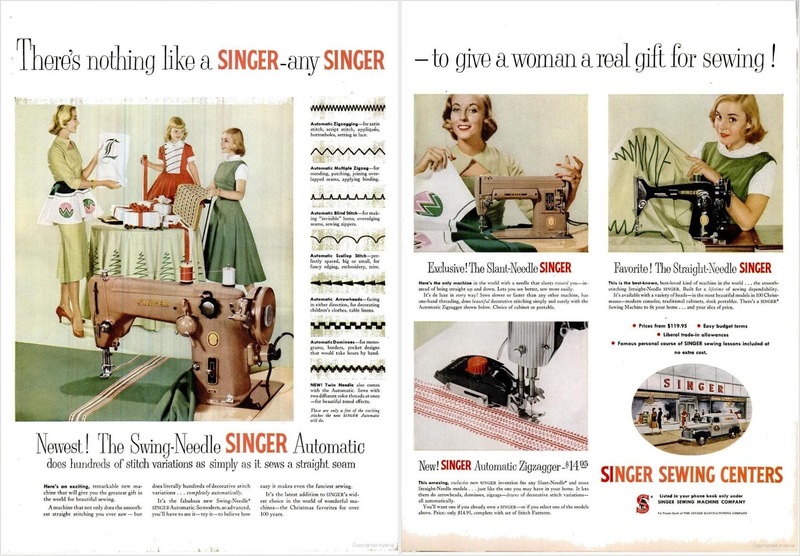 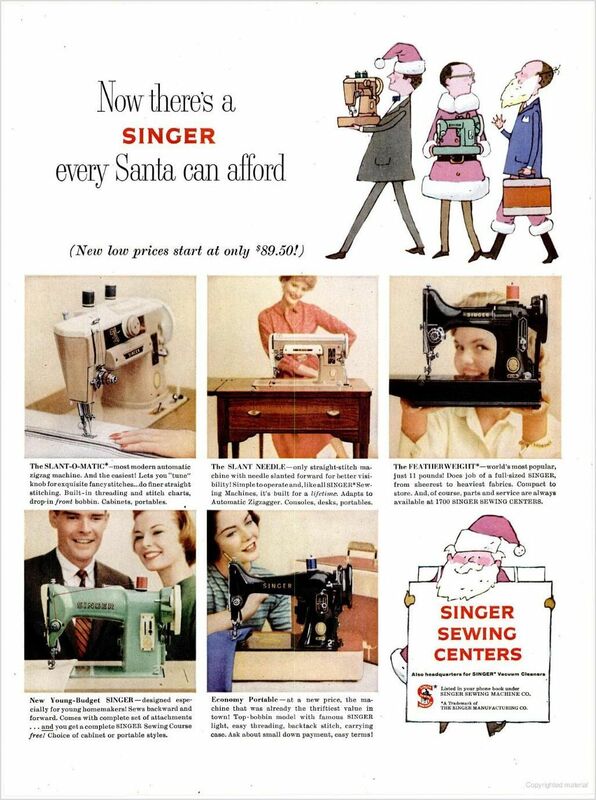 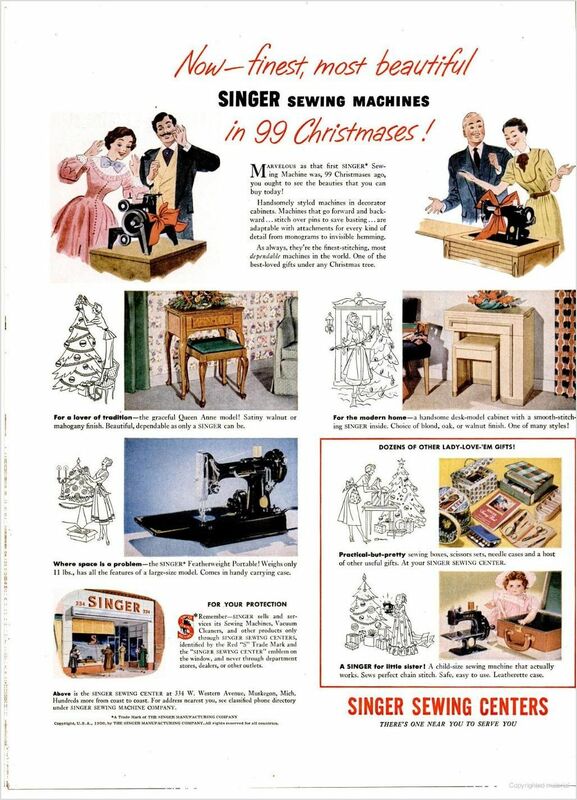 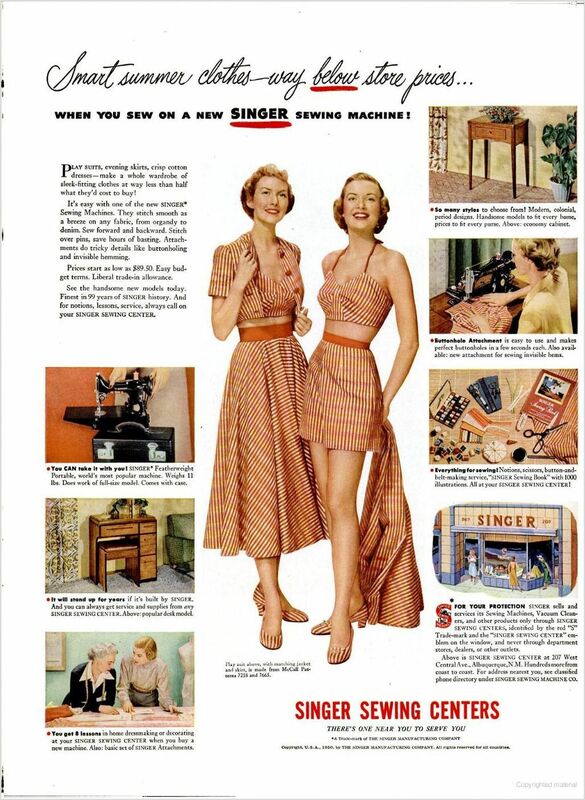 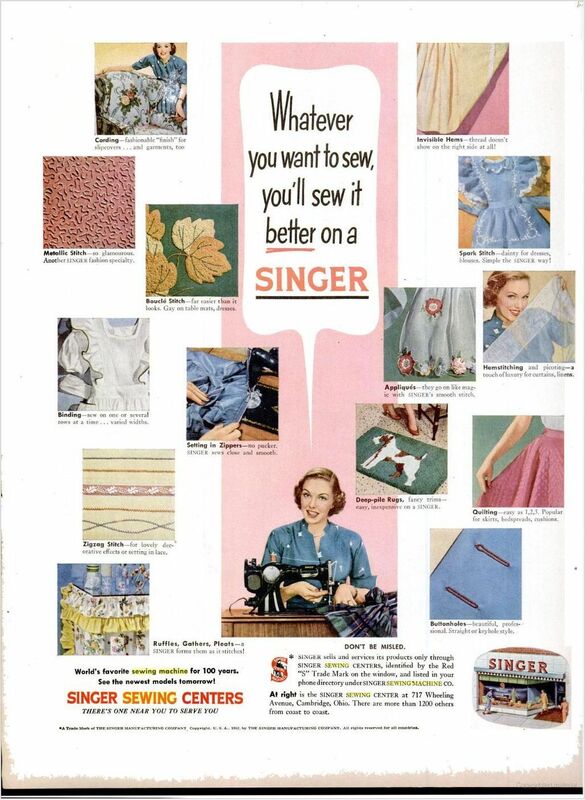 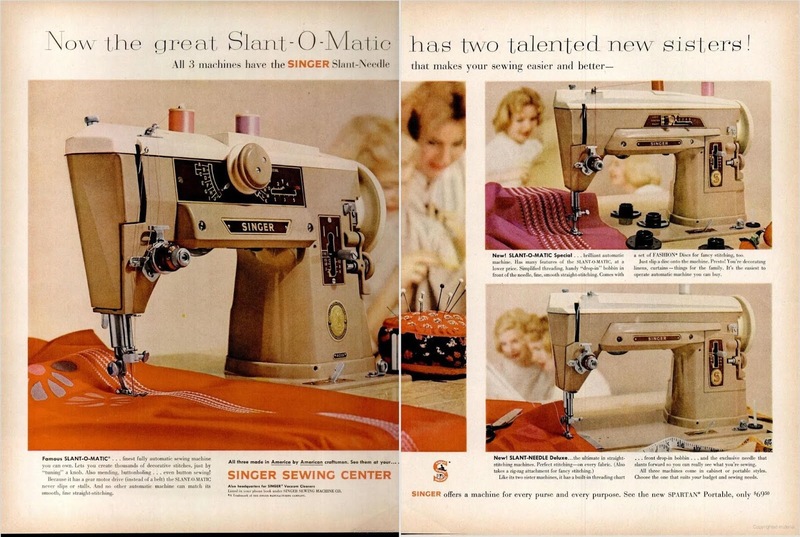 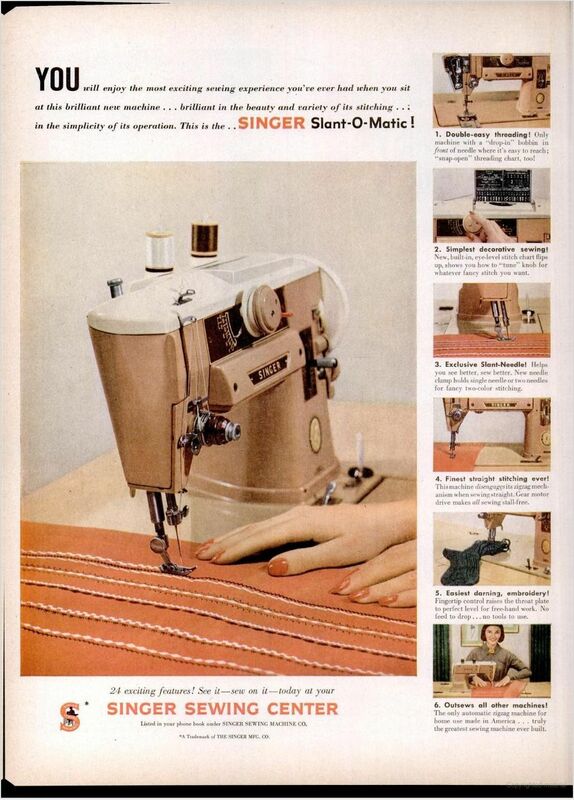 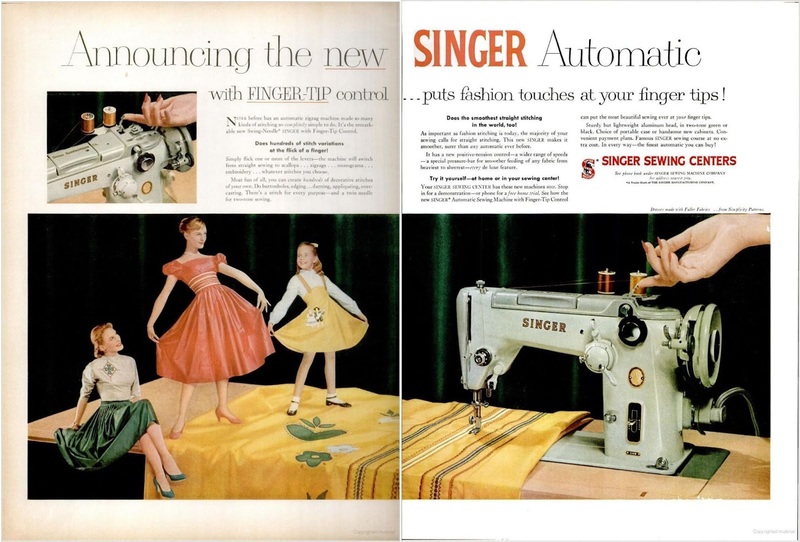 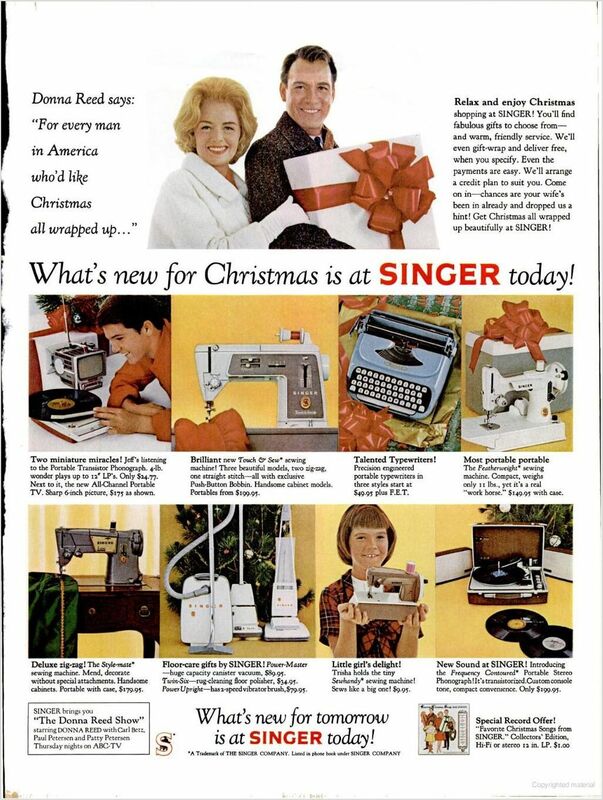 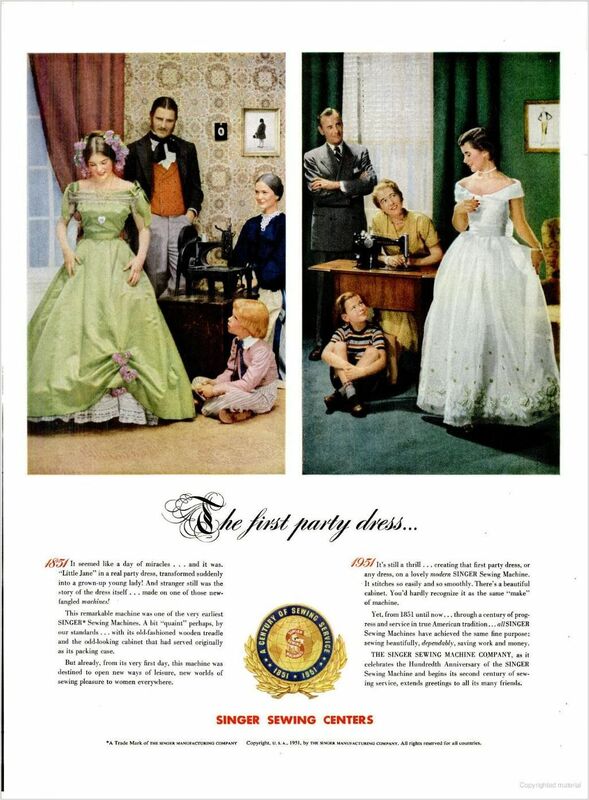 Let's enjoy not only the nostalgia of these Singer ads from 1945 - 1964, but also what they tell us about American values evolving through the decades. 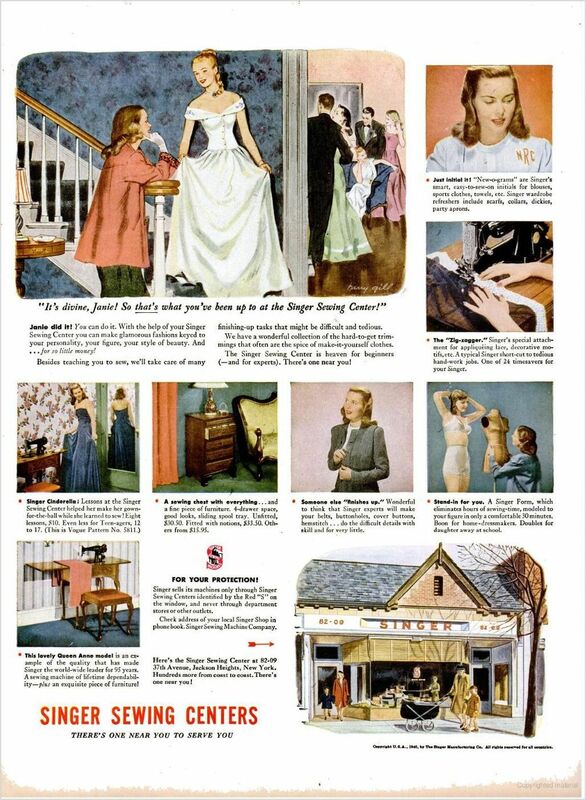 Notice the ads often include dense text that presumably the ladies of the times would carefully read for facts and inspiration - contrasted to modern marketing that must factor the attention span of the Twitter-age. 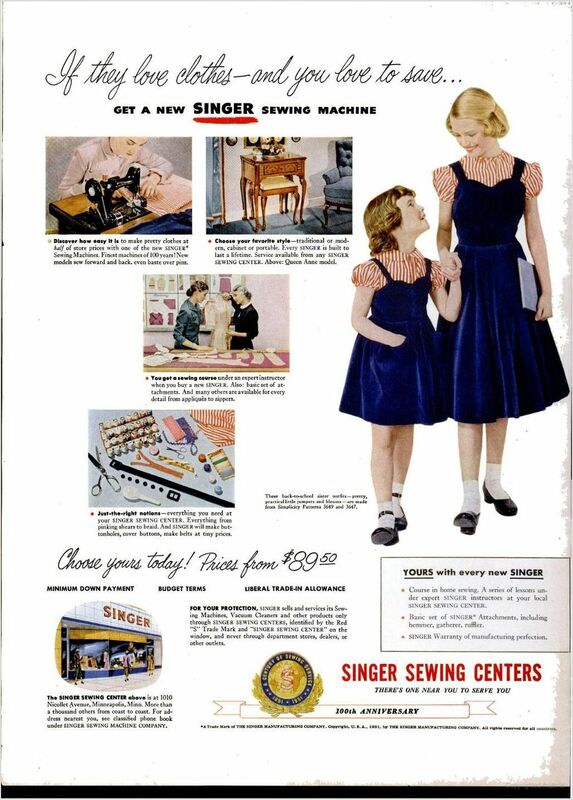 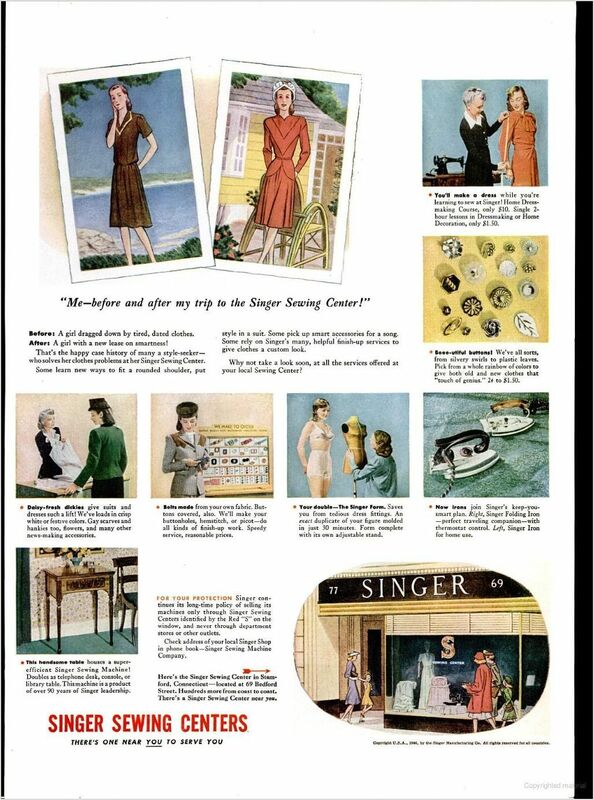 Notice the inclusion of young girls - isn't it easy to imagine daughters becoming just as excited as Mom for a visit to the Singer showroom? 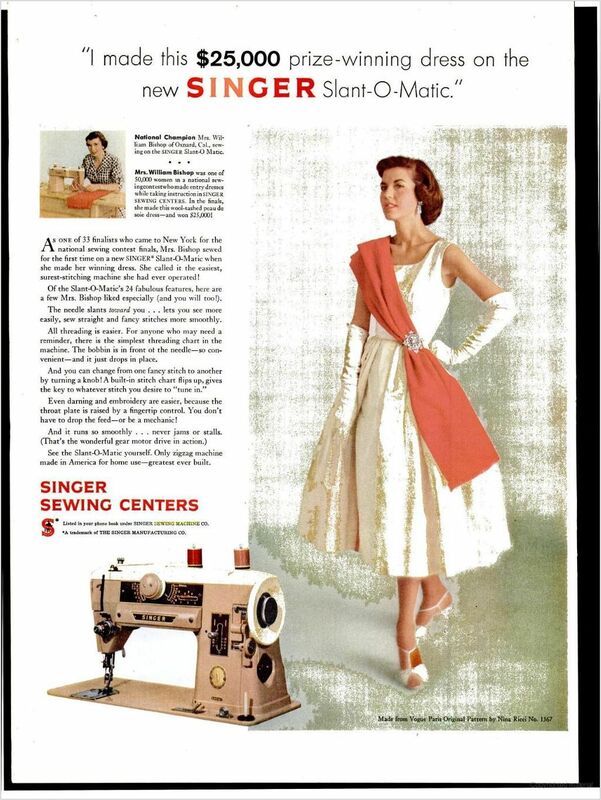 INSTRUCTIONS FOR SAVING THE LARGE IMAGES: You can click on any image to enlarge it on your screen. 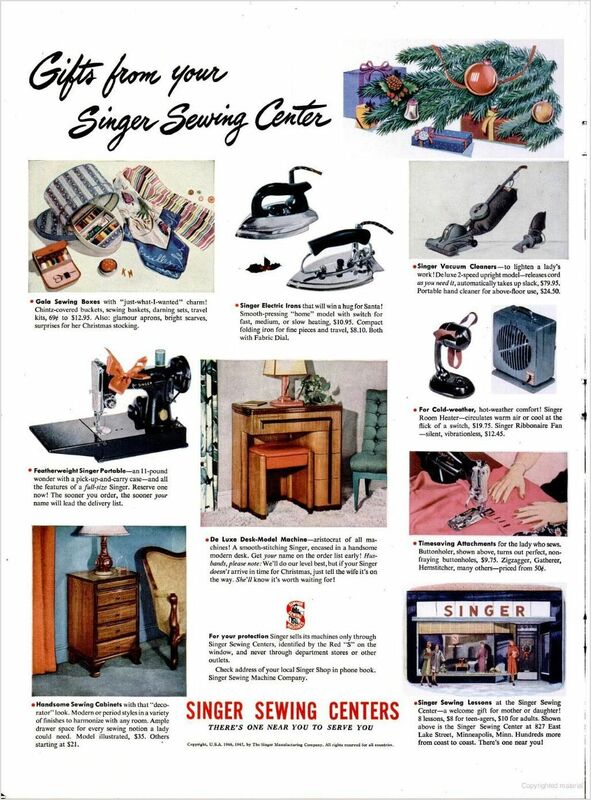 Then, to save it full-sized to your own computer so that you can really enjoy the detail, right-click on the enlarged image and choose to "Save Image As." 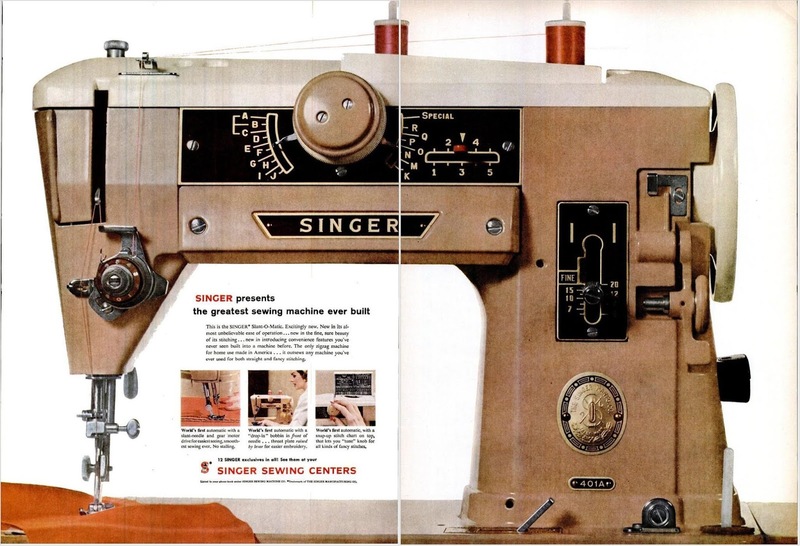 Mac computers might use slightly different terminology, but the option to save the file/image should be obvious. 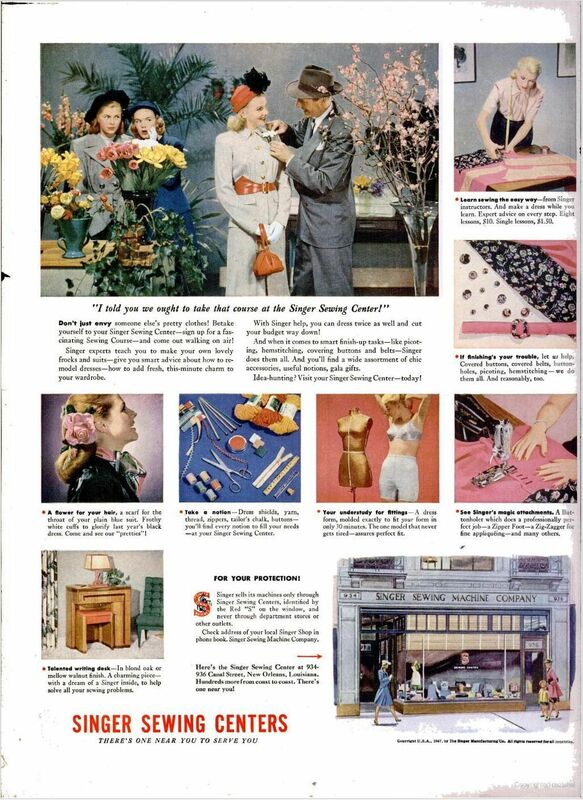 Our thanks to VSM collector and historian Will McCann for the beautiful magazine ad scans. 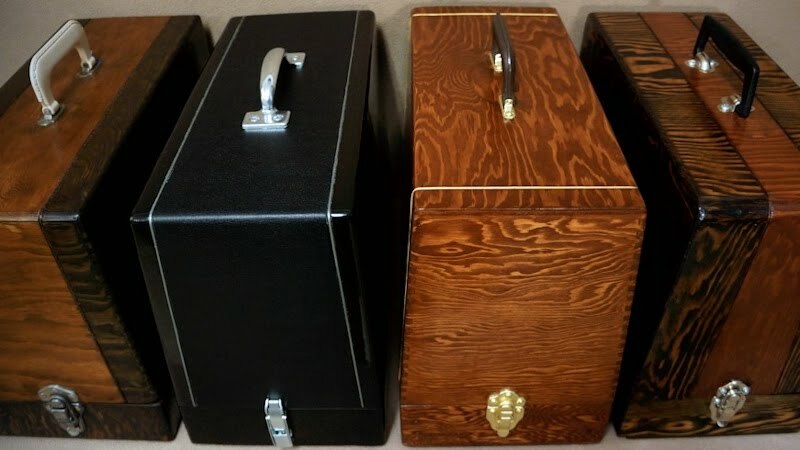 Thanks for a great look back! 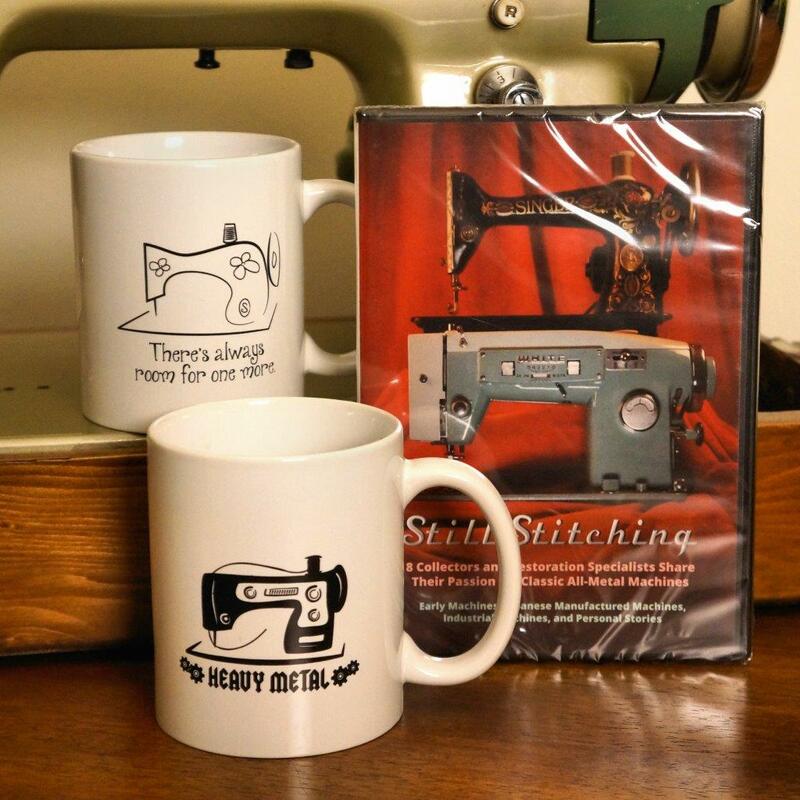 Thank you so much for sharing these images! 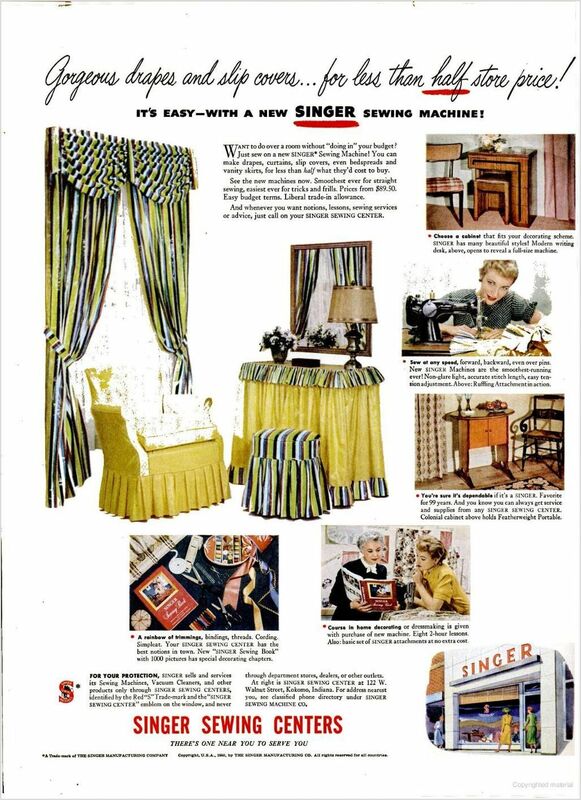 As the "Son of A SINGER Man" seeing these magazine ads brought back a lot of childhood memories from my past. 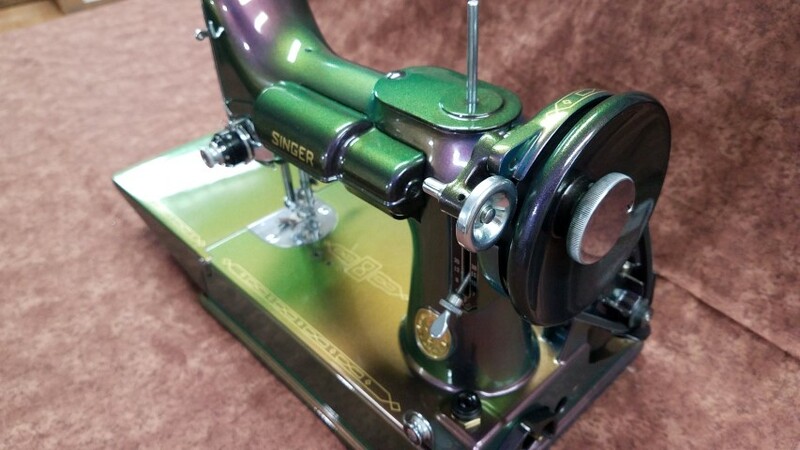 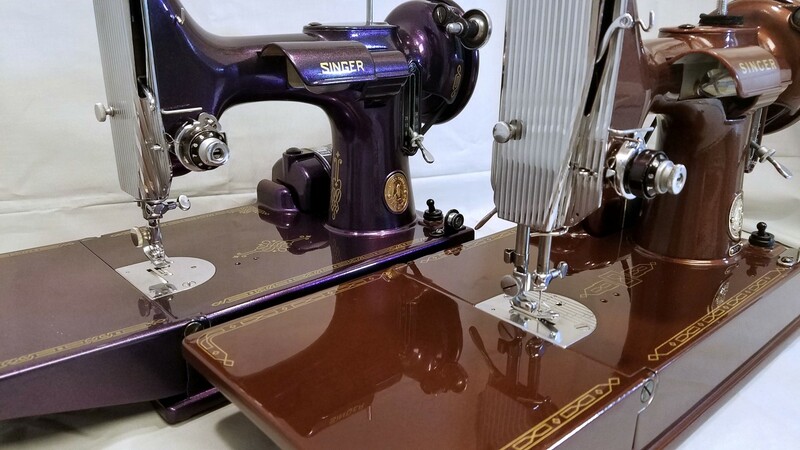 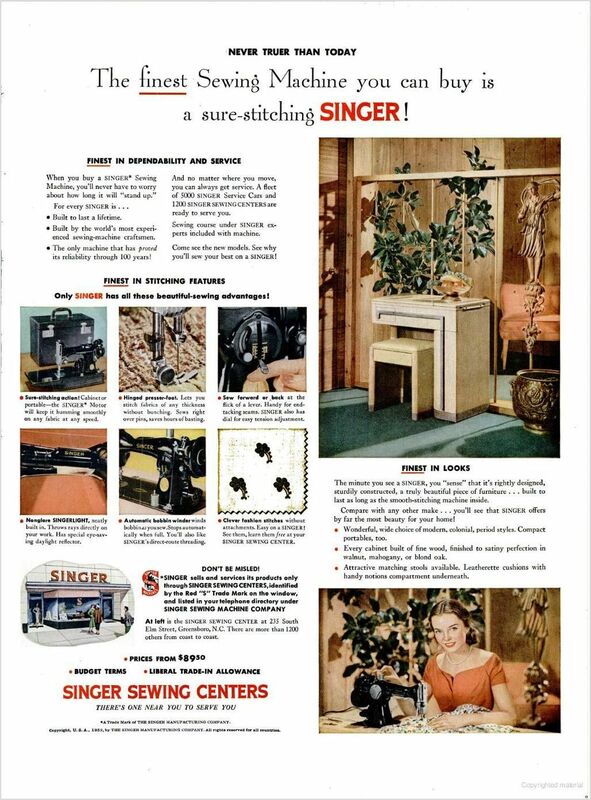 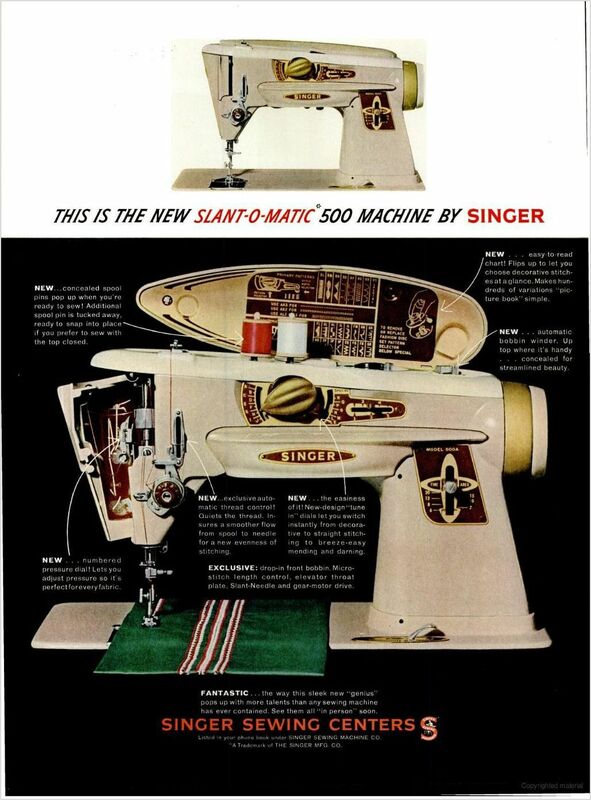 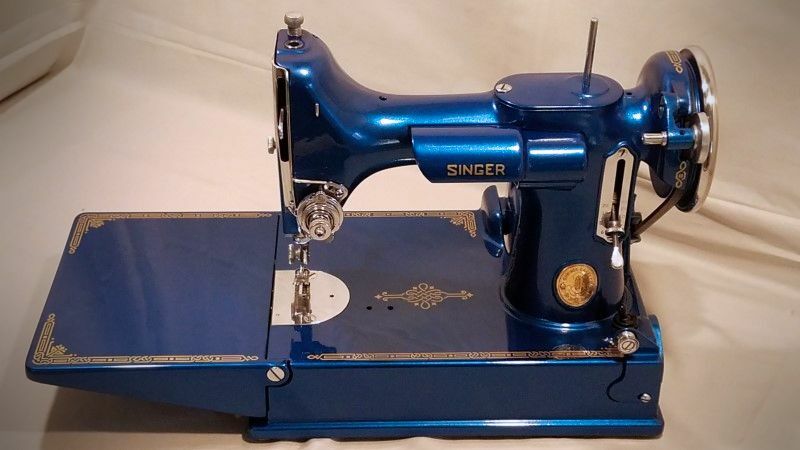 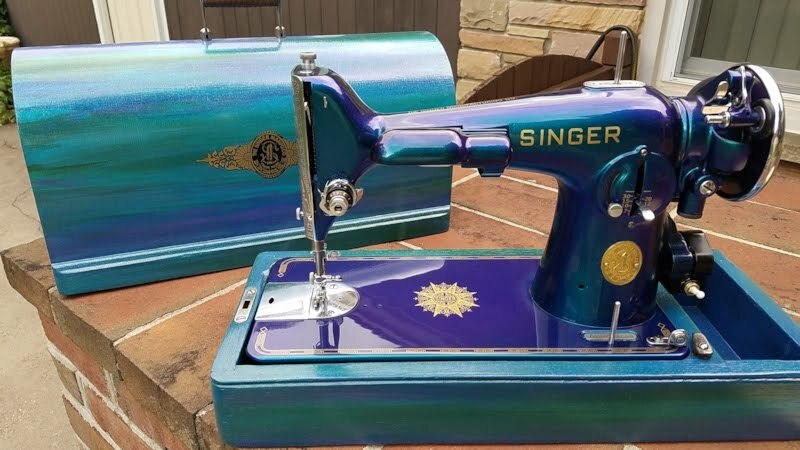 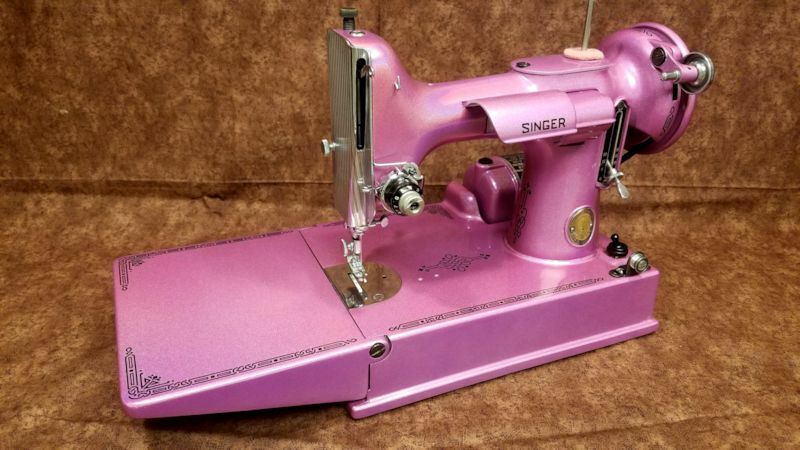 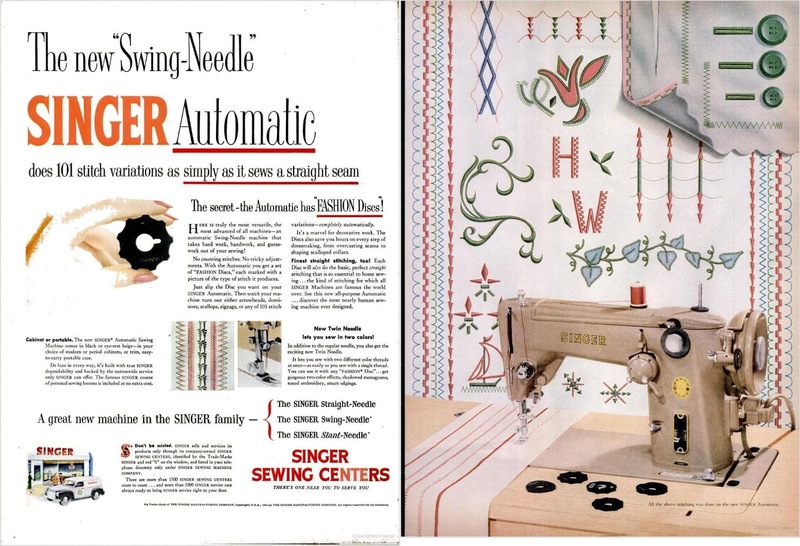 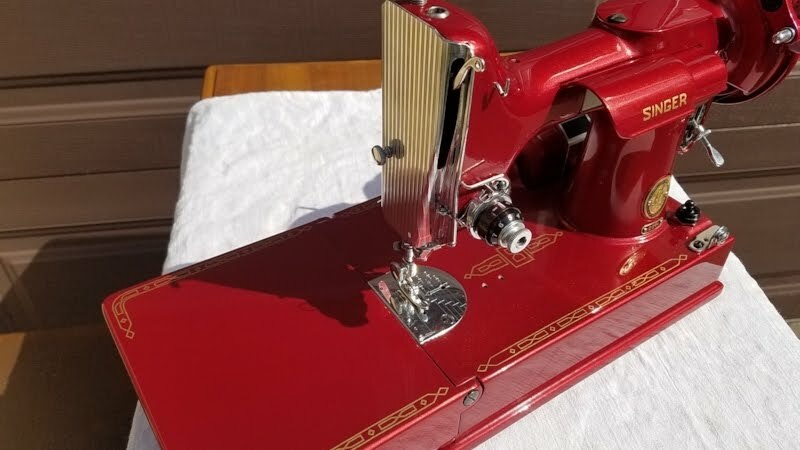 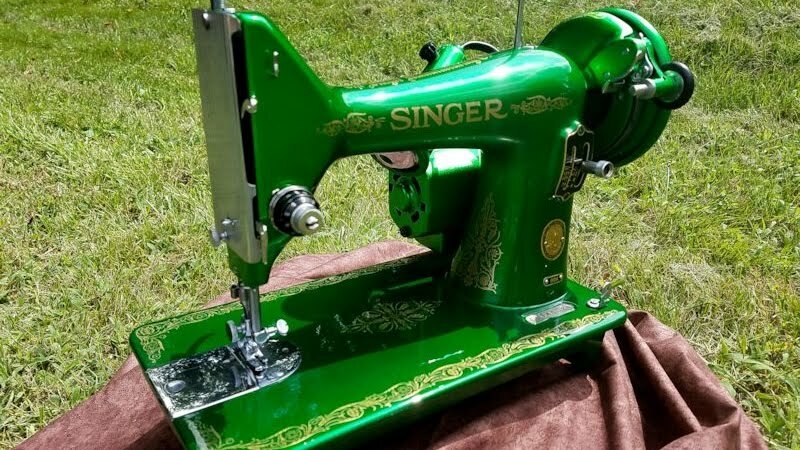 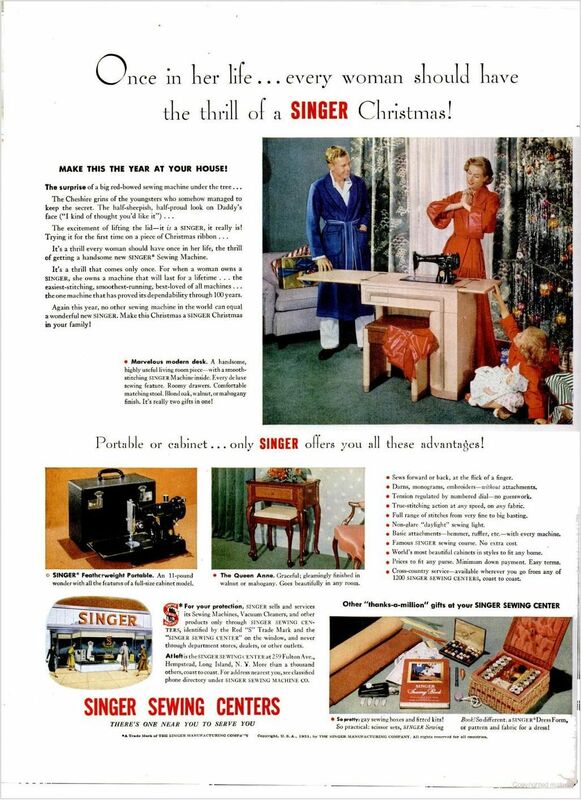 My mom always had a SINGER sewing machine, and now her SINGER Model 401A (the last SINGER machine that my dad brought home for her before his unexpected death in 1960) and its SINGER portable sewing table are mine. 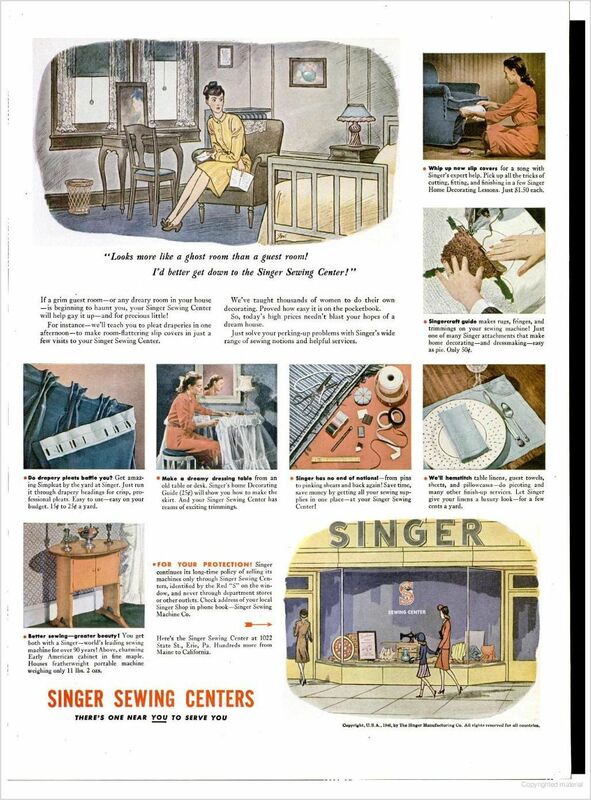 Up until his death, there was always a SINGER Panel Truck parked in front of our home in South Omaha whenever he wasn't at work. 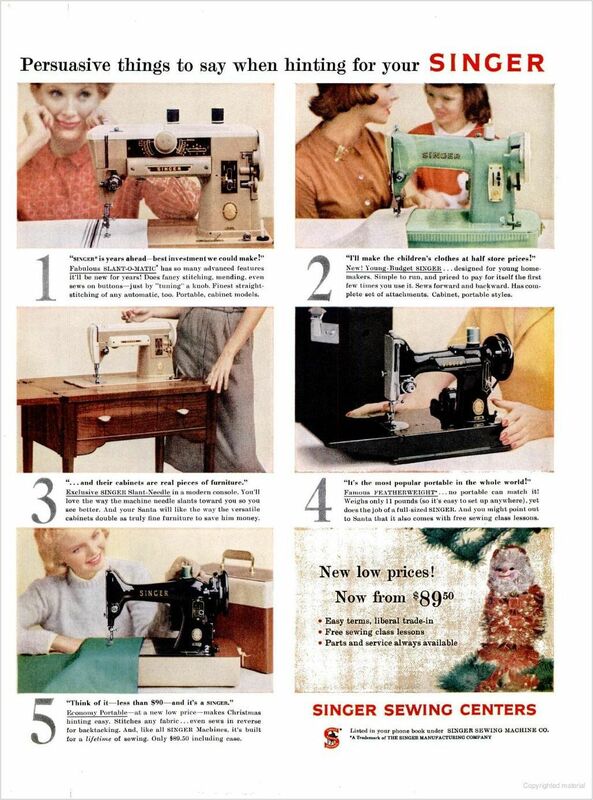 Bernie, we're so glad these brought back good memories. 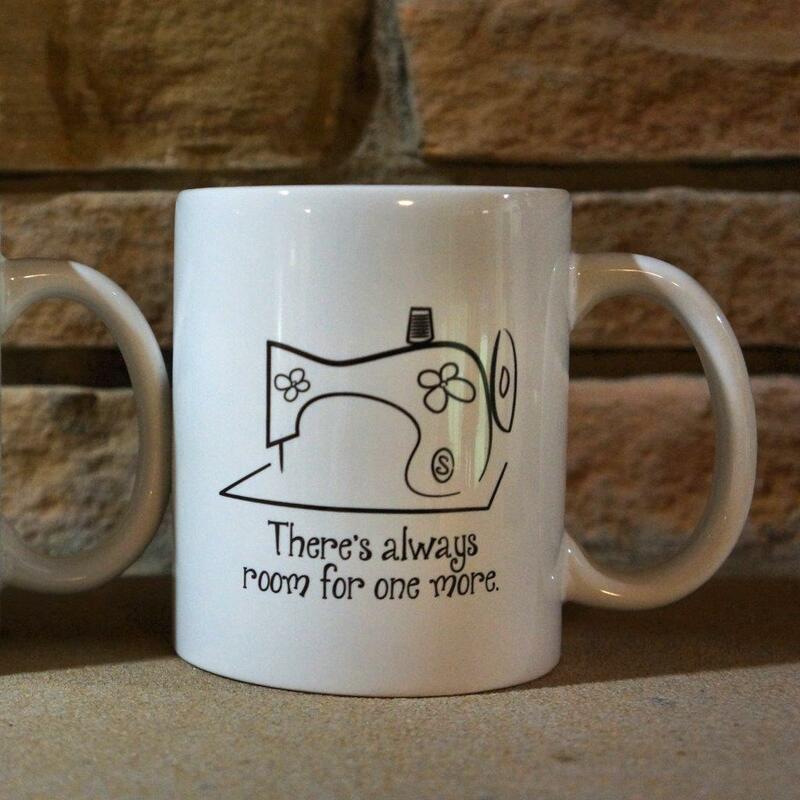 And thanks for sharing some of them here with us.